Horse-drawn carriages in New York City’s Central Park New York Central Park Horse Carriage[/caption] date back to the 1880s, and have been a popular tourist attraction since at least World War II. But, that may soon be a thing of the past, if Mayor Bill de Blasio keeps his campaign promise to banish the Central Park carriage horses – he has delayed that action until the end of the year. The proposed ban would require the owners to give up their horses to rescue farms with the assurance that the horses would be permanently retired. And, speaking about being retired, did you know retired drivers pay less for auto insurance? De Blasio wants to replace the horse-drawn carriages with a fleet of electric, vintage-replica, tourist-friendly vehicles, not just in Central Park, but all over the city. The vehicles would cost $150,000 to $175,000 each. Legislation is still under discussion by the city council; several members are against the ban, saying it will eliminate around 300-400 jobs. 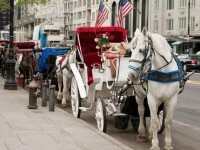 New York City has 68 carriages, over 200 horses and 360 drivers. The plan has created an emotionally-charged debate between animal rights groups and carriage owners. When horse-drawn carriages are mixed with heavy city traffic involving cars, pedestrians, buses, bikes and emergency vehicles, it’s an invitation to disaster. Most horses are not comfortable working near cars and trucks. Horses have a unique response to stress – they run. Over the years, there have been many accidents where both horses and people have been seriously injured and some in which horses have died after they become “spooked” in traffic. In 2010, during the Heritage Days parade in Bellevue, Iowa, one person was killed and two dozen were injured when horses pulling a carriage charged into a crowd of people. According to animal activists, carriage horses have no place in the city’s congested streets. They also cite inhumane conditions endured by the carriage horses. • Prone to respiratory damage because they are constantly nose-to-vehicles’ tailpipes. • Excessive walking and standing on hard streets results in lameness and hoof deterioration. • In summer, horses suffering from dehydration or heatstroke can die in just a few hours. • Many of the stables are firetraps with inadequate sprinkler systems and fire protective devices. • Many horses have preexisting injuries or arthritis due to their previous lives on the racetrack or on Amish farms. • When these horses are unable to work the city streets, they are “retired” – many go to auction where their fate is unknown. • Horses in the field were not examined by a Department of Health and Mental Hygiene veterinarian for an entire year. • Scheduled stables inspections by the veterinarian, including travel time, were limited to only 25 minutes per location. • During hot weather, horses on the street did not have ready access to water or there was inadequate shade. • Poor street drainage left horses standing in pools of dirty water. It remains to be seen if this popular tourist attraction will still be part of the New York landscape. In 1989, the City Council passed Local Law 89, which increased liability insurance for carriage owners. Does this cover damages to your car if a spooked horse tramples your fender, or will your car insurance cover it? Do you think horse drawn carriages have no place being in the big city and should be banned? Feel free to share your thoughts in the comments section below.